The Aroüane House was built at the beginning of the 20th century. It belonged to the Sioui family which transferred it to the Nation Council in 1980 to be used for purposes of cultural dissemination. At that point, it was designated as a Cultural and Tourist Home. 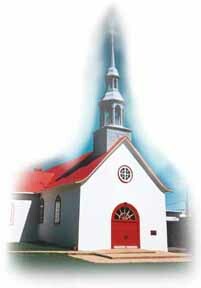 The Notre-Dame de Lorette Chapel, 250 years of history. Built in 1731 out of stone from the Kabir Kouba River, the chapel was destroyed by fire in 1862, then rebuilt on the same foundations in 1865. It was declared a historic monument in 1957. During your visit, you can discover stations of the cross sculpted by Mr. Bourgault, precious metal ware, ancient manuscripts, and much more. Youll appreciate the charms of its liturgical collection. The village of New Lorette, circa 1830, a water colour by James Patterson Cockburn. A Royal Ontario Museum slide (Camille Gosselin Collection). From the 1997 Quebec Historical Society calendar. The Oriawenrak Falls. You'll surely be grateful for a moment of rest and relaxation at the foot of the Oriawenrak Falls. At the same time, you'll be able to dream of the legend which slumbers in these waters. The Kabir Kouba River, whose swift-flowing waters hurtle over the falls, contains a truly fascinating story. It is said that Kabir Kouba, meaning the snake, was a great spirit who was hunted down and whose long and winding body then formed the contours of the river. The waterfall reveals all its splendour at the melting of the winter's snows when you can admire the magnificence and power created by the spring floodwaters. At other times, since the Kabir Kouba originates in Lac Saint-Charles, from which the city draws its drinking water, the river depends on rainfall to provide its flow. As such its splendour is sometimes diminished. The foundations of two mills may be seen in the same area. 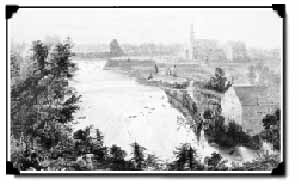 One was built as a flour mill at the foot of the falls in 1731. 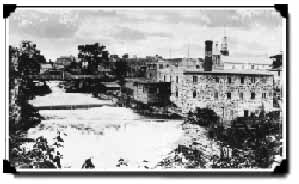 The second, a paper mill dating back to the 19th century, was erected at the top of the falls. Plants play a very important role in the lives of Native people? They have discovered the medicinal properties of all sorts of plant life, which can be used for instance to combat whooping cough and scurvy, and to relieve headaches and sore throats, arthritis, cramps, liver ailments, and so much more. After being boiled or ground, plants yield flour, syrup, herbal tea and dye. (On the other hand, certain other plants have been the cause of hormonal problems and poisoning.) Some plants are still being used today. Its up to you to discover the many secrets of the best-known among them, such as the raspberry bush and the strawberry plant.